Space plays a crucial role in our daily lives, in security and defence, protecting the environment, scientific and technical advances, telecommunications and a host of everyday services. Where there’s space, there’s Astrium, an EADS Company and a leading space manufacturer. Cambridge University Press is a not-for-profit organization that advances learning, knowledge and research worldwide. It is an integral part of the University of Cambridge and for centuries has extended its research and teaching activities through a remarkable range of academic and educational books, journals, and examination papers. Come and visit our stand for 20% off all titles on display. Space science research at The Open University is at the cutting edge of instrument development for planetary science, space science and astronomy missions. We work closely with the UK Space Agency (UKSA), the European Space Agency (ESA) and other national space agencies, universities, research centres and industry around the world to develop instrumentation and concepts for leading-edge space science missions. The Google Lunar XPRIZE is igniting a new era of lunar exploration by offering the largest international incentive prize of all time. A total of $30 million in prizes are available to the first privately funded teams to safely land a robot on the surface of the Moon, have that robot travel 500 meters over the lunar surface, and send video, images and data back to the Earth. The Royal Astronomical Society, founded in 1820, encourages and promotes the study of astronomy, solar-system science, geophysics and closely related branches of science. The Society does this through organising scientific meetings, publishing international research and review journals, recognising outstanding achievements by the award of medals and prizes, maintaining an extensive library, supporting education through grants and outreach activities and representing UK astronomy and geophysics nationally and internationally. Far from the Sun, temperatures are so low that water ice behaves like solid rock. This is the realm of the Ice Worlds, with their volcanoes, atmospheres, and sub-surface oceans that may harbour even life. This exhibit led by UCL, in association with the University of Kent, Queen's University Belfast and Imperial College London, explores the moons of the outer planets and trans-Neptunian objects. 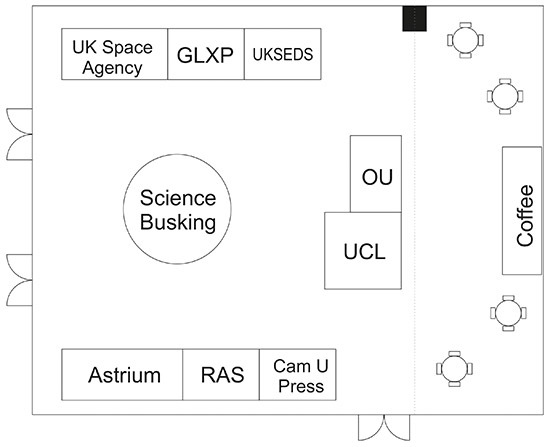 UCL conducts world-leading planetary research via the interdisciplinary Centre for Planetary Sciences at UCL/Birkbeck. The UK Space Agency is at the heart of UK efforts to explore and benefit from space. The UK's thriving space sector contributes £9.1 billion a year to the UK economy and directly employs 28,900 with an average growth rate of 7.5%. The Agency provides funding for a range of programmes through various routes including the National Space Technology Programme and FP7 and works closely with national and international academic, education and community partners. UK Students for the Exploration and Development of Space (UKSEDS) is the UK’s national student space society. We support students and enthusiasts across the country by running space projects, hosting conferences and workshops, and doing outreach to inspire and educate. We’re keen to build links between different parts of the space community, and to promote space beyond that.